Hendra virus is an emergency animal disease transmitted to horses by flying foxes (fruit bats). While Western Australia has not recorded a case of disease caused by Hendra virus, flying foxes in northern WA have shown evidence of exposure to Hendra virus. Horses with Hendra virus can infect people. Four people have died from Hendra virus contracted from horses in Queensland. Horse owners should remain vigilant for signs of Hendra virus in horses. No horses or people in Western Australia have been diagnosed with Hendra virus infection. The likelihood of Hendra virus infection occurring in WA is considered low, because of the low numbers of horses where flying foxes occur, and the relatively low concentrations of flying foxes. There needs to be close contact between flying foxes and horses for transmission of the virus. Flying foxes in northern WA (north of Shark Bay) can carry the Hendra virus. Horses in close contact with flying foxes have some risk of becoming infected with Hendra virus. Horses imported from Queensland or northern New South Wales, or which have had contact with horses from these areas, should be isolated for 20 days and monitored for signs of Hendra virus. People in close contact with infected horses have some risk of contracting Hendra virus. Hendra virus is a disease carried by flying foxes (fruit bats) in Australia, Papua New Guinea and surrounding islands. While the virus does not visibly harm the flying foxes, it can occasionally spread from flying foxes to horses, and from infected horses to people. Hendra virus was first diagnosed in Australia in 1994. As of August 2017, there have been 60 incidents of Hendra virus, resulting in the death of 102 horses. Seven people have been infected with Hendra virus, and four of them have died. All of these cases have been in Queensland or northern New South Wales. No horses or people in WA have been diagnosed with Hendra virus infection. neurological (nervous system) signs such as wobbly gait, lack of coordination, apparent loss of vision, aimless walking in a dazed state, head tilting and circling, muscle twitching, urinary incontinence, inability to rise. If your horse shows any of these signs, and may have had exposure to flying foxes, or to other horses that have had exposure to flying foxes, call your veterinarian or the Emergency Animal Disease hotline on 1800 675 888 immediately. Minimise contact with the horse until you have received veterinary advice. How do horses catch Hendra virus? It is believed that horses catch the virus by having contact with feed, water or other items contaminated by the body fluids (urine, faeces) of flying foxes. In some cases infected horses have transmitted the virus to other horses via close contact with their body fluids. How can I reduce the risk of my horse catching Hendra virus? do not place feed and water containers under or near trees. If possible, place feed and water containers under a shelter. remove horses from paddocks where flowering or fruiting trees may be attracting flying foxes. Return horses only after the trees have stopped flowering or fruiting and the flying foxes have gone. If horses cannot be removed from the paddock, consider fencing (temporary or permanent) to restrict access to flowering or fruiting trees. Clean up any fruit debris underneath the trees before returning horses. if you cannot remove horses from paddocks where flowering or fruiting trees may be attracting flying foxes, try to temporarily remove them during times of peak flying fox activity (usually at dusk and during the night). vaccinate horses against Hendra virus. What should I do if my horse shows signs similar to Hendra virus? Hendra virus infection is a reportable disease — a disease that must be reported to government veterinary officers. If your horse has signs suspicious of Hendra virus infection and may have had contact with flying foxes, has recently arrived from Queensland or NSW, or has had contact with horses from Queensland or northern NSW, contact your veterinarian or the Emergency Animal Disease hotline on 1800 675 888. Should I vaccinate my horses? have any risk of contact with horses from Queensland or northern NSW. No vaccine is 100% effective, so veterinarians and owners should still maintain good biosecurity when handling vaccinated horses and be vigilant for signs of Hendra virus. At this stage the vaccine does not provide lifelong immunity and boosters will be required. The Department of Primary Industries and Regional Development does not require horses to be vaccinated against Hendra virus and there are no import restrictions on unvaccinated horses into WA. 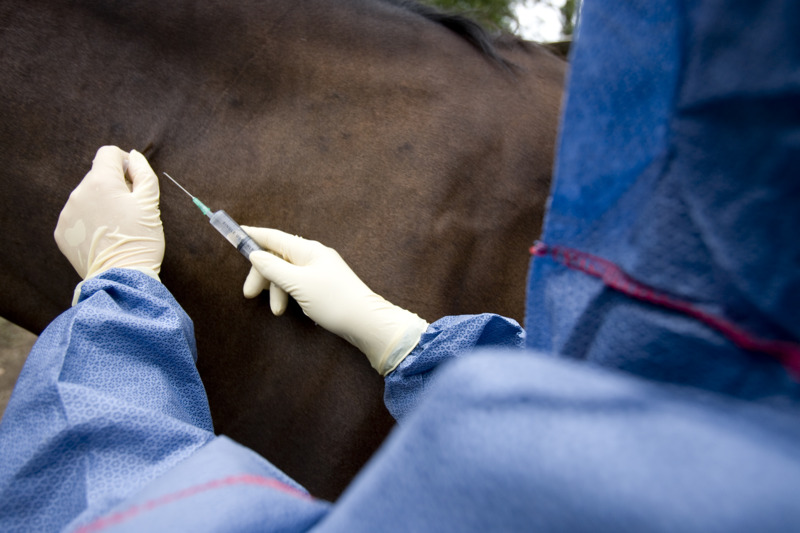 Some veterinarians who work with high-risk horses may only accept clients whose horses are vaccinated in order to reduce the risk to their health and safety. What is the risk of horses bringing in Hendra virus from other areas? Wherever flying foxes and horses have contact, there is a risk that horses could develop Hendra virus. Therefore, recently arrived horses from Queensland or northern NSW could be incubating Hendra virus. Horses travelling to and from northern WA may also have a risk of contracting Hendra virus if exposed to flying foxes. Horses at shows or events may also be exposed to horses from Queensland or northern NSW, which may be incubating Hendra virus. It is advisable to isolate horses that have been in areas where there are flying foxes or in contact with horses that have been exposed to flying foxes for 20 days and to monitor for signs of Hendra virus during that time. How do people catch Hendra virus? People have also been infected with Hendra virus after very close contact with infected or dead horses. To date, seven people have been infected with the virus, and four of them have died. To date, there is no evidence that people have caught the virus from other people or from flying foxes. How can I reduce the risk of catching Hendra virus from my horse? has recently arrived from Queensland or northern NSW. Immediately isolate the horse from other horses, people and animals, and contact your veterinarian or the Emergency Animal Disease hotline on 1800 675 888. Guidelines for handling horses suspected of Hendra virus and for personal protective equipment are available on the Queensland Department of Agriculture, Fisheries and Forestry website. Where are flying foxes found in WA? Only the black and little red flying foxes are found in WA. The risk area for horses having contact with flying foxes is north of Shark Bay. Although small numbers of red flying foxes may occasionally be sighted south of Shark Bay, these are not in high enough numbers to present a high risk of transmitting Hendra virus to horses. A map of the distribution of the main flying fox species shows the distribution of the two species found in the north of WA. In May 2013, two horses in Queensland died as a result of being infected with Australian bat lyssavirus. These are the first recorded cases of Australian bat lyssavirus in horses. Three people in Queensland have also contracted Australian bat lyssavirus from contact with infected bats and died. Although Australian bat lyssavirus is very rare, horse owners are reminded to minimise contact between any species of bat and their horses’ feed and water. As Hendra virus signs vary considerably, veterinarians should always consider their safety first. Always assess the risk of Hendra virus before examining a horse and wear appropriate personal protective equipment (PPE). If veterinarians see signs suspicious of Hendra virus, they should immediately ring the Department's Diagnostic Laboratory Services - Animal pathology unit on +61 (0)8 9368 3351 or the Emergency Animal Disease hotline on 1800 675 888 for advice on correct PPE. The most recent ‘Guidelines for veterinarians handling potential Hendra virus infections in horses’ is available on the Queensland Department of Agriculture, Fisheries and Forestry website. The Australian Veterinary Association also has a video describing the use of PPE.